Greetings, Twin City Conspirators! I’ve roamed away from my home range (the hills of New Hampshire) to spend a little time here, and would love to meet some of you. Join me at 7pm at Diamonds Coffee Shop for Inter-Regional Exchange, Drawing, Chatting, Showing Off Of Comics, and Et Cetera! Sorry for the short notice; I’ve been trying to juggle a lot of things while I’ve been here & had trouble figuring out when to do this. So – the last minute it is! I’m here through the end of the week, so feel free to drop me a line at colintedford@gmail.com if you’d like to hang out. I’m hoping to make it to the Open Studio Saturday, schedule permitting. 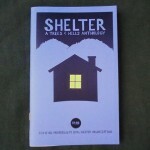 You can see my comics here and the Trees & Hills Comics Group of VT, NH & west MA, which I co-organize, by clicking the name. I’ll have a suitcase full of comics by various New Englanders with me at the event. Hope to see you! 7000 BC is pleased to be a part of the West Texas Comic-Con, Saturday, November 7 in Lubbock, Texas. We’ll be there alongside regional creators and other guests, so stop by to check the selection of comics from Northern New Mexico. Thanks to Will at The Lubbock Sketch Club for the invite! Mpls. Sat. Open Studio Oct. 31, noon – 4 p.m.
“Boo!” and stuff. Join us for drawing and socializing at Minnesota Center for Book Arts. In the Halloween spirit, you will be able to take part in the recording of a little bit of Ken Avidor and David Steinlicht’s forever in pre-production movie “Bicycle Zombie Slayer Girls.” Be a zombie and get killed. No zombie make-up needed, please. Dress in regular clothing. We will be providing nifty paper-and-paint make-up and effects for four or so participants. No messy liquid blood or entrails bits to clean off your clothing afterward. Any recording will take place in the ally out back of MCBA, weather permitting. If you can’t find us in the MCBA building, ask the friendly person working in the MCBA bookstore. This is an open studio — all are welcome. Local Comics Week is coming up, and I haven’t gotten a lot of responses. Please let me know if you’re interested! Thursday Night Comic Jam in San Francisco, October 29, 2009. Well, it’s time for another Comic Jam at the Church St. Café this Thursday Oct 29, 2009 from 6:30 to 9ish. So bring your favorite materials and come make comics and art. This week we can discuss ‘what we learned from APE 2009’ as well as share some of the goodies we picked up. I think it would also be cool to work on a comic that would tie into the magic of the upcoming holiday season. I have an ulterior motive that I hopefully can talk about next week and I think a book that we can sell during the festivities. Don’t forget to join our Google Group where you can discuss with other artists all sorts of cool stuff. This is a repost/reminder… note that it is right next door to the Porcellino/Sally book release at Big Brain the same night! October 22nd is our dear, departed comrade Eric Lappegard’s (AKA The Vegan Ninja’s) birthday… come raise a drink to him and celebrate his life at Grumpy’s October 24th. Some of Eric’s family will be there from South Dakota, and would love to see as many people as can make it, even if they can only stop by for a short time. my very good pal John Porcellino has been on the road for the past 5 weeks, traversing our great nation in celebration of the release of his new book “MAP OF MY HEART: selected comics 1996 -2002” (Drawn & Quarterly) and not only that but GET THIS: also marking 20 YEARS OF KING-CAT. i know, it’s crazy. so, yeah; John has been doing his zine for 20 years, and it’s pretty well agreed that King-Cat is perhaps the greatest mini comic, uh…ever. John has been HUGELY influential and i’m not even going to get into all that because i’d be up typing for another 2 hours, but it’s a big deal (in a very quiet, small way). and John has said to me many times on the phone about the comics that make up “MAP OF MY HEART”…”they’re the best comics i’ve ever done”. and you know– they ARE. and with someone like John, and a magazine like King- Cat, that’s saying something. i’m not kidding, this is a VERY SPECIAL BOOK. 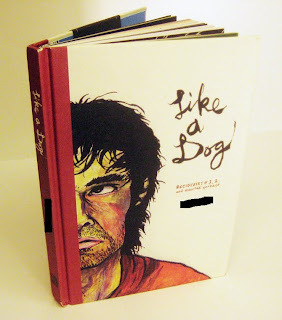 and not only that, but MY new collection of old stuff is coming out too– it’s called “LIKE A DOG”, and it’s a fancy hardcover book with a bunch of full color stuff in it, collecting the first 2 ‘zine issues of “Recidivist” as well as a bunch of other stuff i did for anthologies and whathaveyou, all decked out with extensive “liner notes”. my pals at Fantagraphics were nice enough to publish the thing, and i’ve got to say– i’m extremely proud of this book. i really am; it came out better than i could’ve possibly hoped. so it’s a RELEASE PARTY FOR BOTH BOOKS!!! HOORAY!!! michael’s puttin’ it on, so we’ll both be at BIG BRAIN COMICS (that’s 1027 Washington Ave S Minneapolis, MN 55415 (612) 338-4390) signing and shooting the breeze from 5 til 7:30 or so on SATURDAY, OCTOBER 24.
from 8 to 10 or so, where Johhnny will give a presentation about 20 years of zinehood. come on down and say hi. 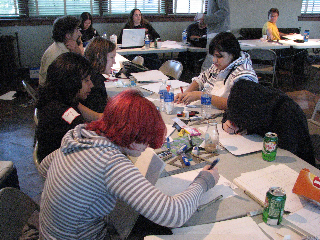 24 Hour Comics Day 2009 at the Harwood Art Center had a great turnout this year! We may have had the largest attendance of any location in the world, with 41 people making the attempt (including 2 who worked from home and kept in contact with us throughout the night). We had 11 people who made the trek from Santa Fe, Ms. Webber-Bey and a big group of her Comic Club students from Albuquerque, and Mike Hanlon who came all the way from Alamogordo! Thanks, Mike. Most folks stuck with us at least until morning. In the end, 16 24-page comics were completed by 18 creators (2 were made by 2 people collaborating). Kathy from the Harwood tweeted us. See the work completed by Ralph Contreras, Elizabeth Wilkinson, who were each working from home, and Kervin Bolts and David Castillo’s joint venture. I collaborated with four artists to create original pieces of art inspired by short stories based on the Faust legends. These ‘graphic novellas’ are being released in the weeks leading up to the opening of our new play .faust opening on November 6 at the Red Eye Theatre. Joel Vollmer created a piece called “The Summoning” that tells the story of Faust summoning Mephistopheles from the forest floor. Jessica Boire made a comic called “The Learned Gentlemen” where a female Faust teaches three Masters a lesson when confronted about her new-found power. Max Lohrbach painted dreamlike images for “Faust in Hell” accompanied by the story text. Andres Guzman took a different approach for “Mephistopheles” and created a single image showing the classic Faustian demon. “The Summoning” will be viewable on our website – sandboxtheatreonline.com – this week with the others coming after that.